You are starting an art business. You have the capital, the stationary and the premises, now you need to promote your business. Posters and fliers are great tools to help you do this. However, you need to be clear about the message you are sending out and posters and fliers each have their own job to do, confusing the two will make you look unprofessional. There was one a time when you needed to visit your local printer in order to get your fliers and posters printed, but today you can do it on your PC easily using readily available software. However, you won't be able to achieve the glossy finish that a print specialist can. With your fliers and posters it is worth spending extra and having them designed professionally. With your stationary it is acceptable to print your own, but with fliers and posters they will be given directly to the public, sent out as mail shots, advertise your events and exhibitions and will be under very close scrutiny for quality. First impressions count in business, make yours a hit. Fliers are normally A4 tri-fold brochures that advertise your product, give out your contact details, showcase your work and let people know what you can do for them. The best way to distribute them is via mail shots. You can buy a list of address from places such as Business Link, for a nominal amount, and they will even print off labels for you to put onto your envelopes saving you precious time. You can also place them at the front of stall or on the desk at an exhibition for people to take. Although a person may not purchase anything while they are at your stall/exhibition, if they have a flier they may well come back later. 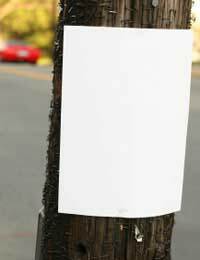 Fliers should contain as much information in them as you can fit it. Although they are a sales tool, try to keep it to a 'soft sell' approach. People prefer to make their own minds up and your work should sell itself if it is of high quality and have some good Unique Selling Points to make it stand out from the competition. These can be anything for A4, A3 or larger depending on where they are going to be positioned. Unlike the flier the job of the poster isn't to sell your goods, it is to inform people of an event where they can see your work. You will often see posters around the town, fastened to lamp posts, in shop windows or on walls informing the public of things that might be of interest to them such as a craft fair or solo/group exhibition within the local area. The poster should include the date, time, place, artist details and nature of the event. It should be bold, eye-catching, but easy to read. Going for fancy hard to read fonts will cost you in attendance figures and ultimately sales. If you are selling from a shop or your own gallery you won't need to think about posters, unless you are doing a specialist exhibition on perhaps sculptured frogs or glass mermaids for a limited time. Whatever means you use to promote your business, always go for the best you can afford and include as much information as you can. Lack of publicity could result in failure.